Hundreds of millions of people all over the world are medically blind, while many more are in the process of turning blind. In most cases, eyesight degeneration can be avoided or hampered if a diagnosis is timely made, but for people living in remote, poor areas of the globe, visiting an ophthalmologist is not possible. The Portable Eye Examination Kit, or Peek Retina for short, seeks to be a solution to this problem. It’s a cost-effective portable device that can be strapped to any smartphone and turn it into an effective eye examination tool. A doctor could use it in the field to make a rapid diagnosis in remote areas where there isn’t any access to professional equipment typically found in an ophthalmologist’s cabinet. In other cases, it can empower regular people with no formal training to make an eye examination, take a picture via the built-in smartphone camera and then send it to a professional for an advised opinion. 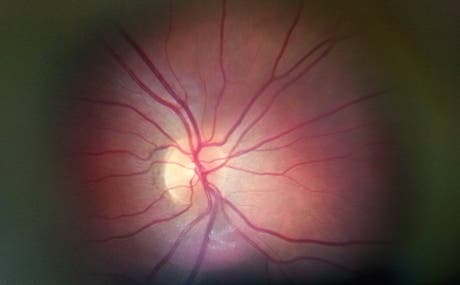 An image of the inside of the eye taken with Peek Retina. According to the team behind it, Peek Retina could prove to be useful in identifying common eye degeneration diseases like glaucoma and cataracts, but also complications of diabetes, malaria, and meningitis which affect the retina and thus provide telltale signs of disease. An early diagnosis could save someone’s vision and maybe even lives, and the Peek Retina seems to have the potential to empower individuals. Of course, poor people from developing areas like Mali, Botswana, and Kenya – where the device was tested – don’t have enough money to buy a smartphone or, in some cases, even electricity to charge the phone in the first place. The tool isn’t meant for anyone though; it’s geared toward doctors who have to travel to their patient’s doorstep for examination, and for them this could prove to be invaluable. Over the past two years, clinical trials have been carried out with promising results. Based on these, the researchers behind Peek Retina believe the device could be used by a healthcare worker to assess over 1,000 people per week. To scale the Peek Retina, its creators have launched a crowdfunding campaign to help raise money to scale the product. The manufacturing equipment required to mass produce the device costs £150,000, but the campaign’s target is only set to 70,000 since the rest of the money came from grants by TED and Mazda.